SACRAMENTO, Calif. – The St. Francis cross country team will travel to Chicago, Ill., to compete in the Palatine Invitational this weekend. The meet serves a gathering between St. Francis and sister-school Assumption High School from Louisville, Ky. Assumption Head Coach Barry Haworth’s daughter, Moriah, ran for DuCray and St. Francis and the two developed the relationship between the schools. They schedule meetings every 4-5 years for a competition and friendship between the programs. It is the second trip made by St. Francis, while the Rockets have visited Sacramento two times. Assumption, like St. Francis, is an all-girls Catholic High School. The Rocket program has been very successful lately, winning four state titles in the last six years. The two squads will meet for dinner on Friday night courtesy of the Rockets and have a picnic following the competition. The race is scheduled for the three-mile course at Deer Grove East. Assumption is the defending girls’ champion in the event. Following the Saturday morning race, the team will have an opportunity to go sight-seeing around Chicago. Seniors Miranda Myers and Peyton Bilo will document the trip to Chicago via posts on the St. Francis social media accounts all weekend on Facebook, Twitter and Instagram. Follow #TroubieTakeover. Meanwhile some schools don't have busses to their races. And use coaches/parents and carpool to meets just fine. Some teams also do a great job fundraising and go wherever they please. You can choose to complain and be a victim or you can choose to make things happen. Reality check.I hardly think it is a matter of the public school kids not "making things happen" with fundraising. It is a matter of a private school for children of privilege vs. free public education. And for the record, I don't believe there is anything wrong with that difference... it is what it is...life! But I also don't think the kids from public schools should feel like they aren't "making things happen" because they can't raise the money to fund a trip half-way across the country to run a race, among all the other expenses that come with participation. My daughter goes to a private catholic school. Her team limits them to one overnight travel meet per season other than the state meet and that is to Clovis. They miss out on Mt. Sac for XC and other prestigious meets - that's jut the way it is. I have seen many public schools traveling out of state and to multiple meets in California which require overnight stays. As Albert says, it's about fundraising and parent support and not privilege. Mt. Pleasant and Piedmont Hills (CCS) are not high end or private high schools send their athletics to Arcadia, Penn Relays, outside CA indoor meets, etc. These high schools I think are lower middle class schools. The coaches and others do a great job fund raising. It can be done but it takes commitment and hard work. Anyone priced a weekend trip to Chicago recently? these girls must be AMAZING fund-raisers!!!! Joking aside, good for them. Regardless of how they get there it sounds like a super fun trip. Got this note in regards to the trip. SACRAMENTO, Calif. – The St. Francis cross country team’s flight to Chicago was canceled Friday morning forcing the team to call off its weekend trip. The Troubadours were traveling to Chicago, Ill., to compete in the Palatine Invitational this weekend. The trip included 17 student-athletes and three coaches. 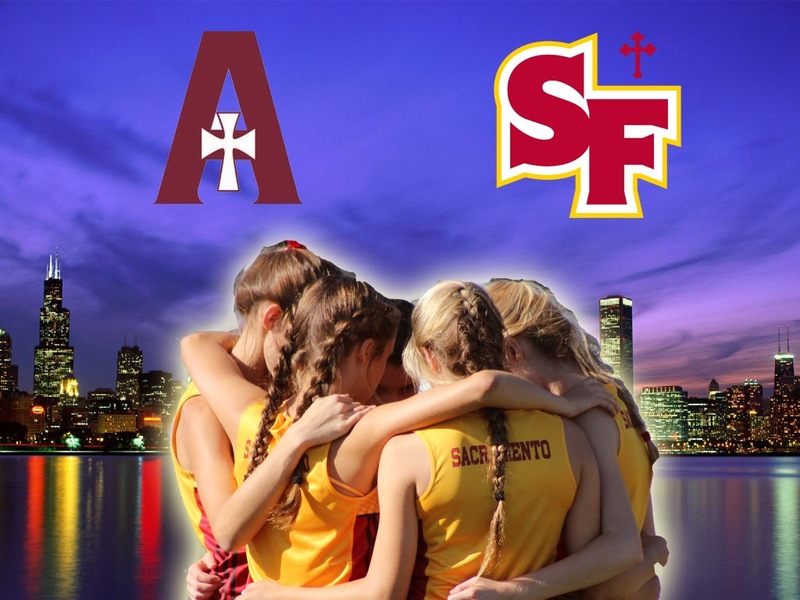 St. Francis will return to running on Oct. 8 at the Delta League meet at Granite Regional Park. As a public school teacher you would be amazed at how little money there is available. A bus trip just 3 miles down the road can cost between $70 for a district bus or upwards of $250 if there are none available and the school uses First Student. My classroom budget that includes all supplies and copies (at 3 cents per page) is $475. That is for the entire year. We were not allowed to ask parents for donations until this year. And at that we had to make very clear it was strictly optional and we could only ask for $2. I know schools that are simply told no to new uniforms and yes, busses to meets. You make it all seem so easy to go and fund raise and make it happen but you do not understand the politics (and in many cases the law) involved in such things. I am not complaining and not the poster above. I am working to make things happen. But please know for those working in low income areas it is not as simple as "make things happen." It amazes me how some schools have so much while others down the street, in the same district but in a minority neighborhood have so little. I am the 1:07 poster (also 9:34) and I am still trying to wrap my head around the fact that someone would think my last post classifies as "hate." Saying the girls must be amazing fundraisers (albeit with a tad of sarcasm :-) and that it doesn't really matter how they got there and that I hope they have fun. That's hate? Wow. For the record, I am not a teacher or coach, I am former runner who really loves the sport and that is why I keep up with this awesome blog. Thank you Public School Teacher above for your hard work. Are you allowed to take donations more than $2 from the community? If so, I would like to send you $50 to help support your class this year. I am not willing to post my identity (being a hater and all :-). So if you think of a way for me to get the money to you, please post it. Thx. Otherwise, just keep up the great work! !